Tripp Widder, grandson of Ed Reynolds, at the display based on the artifacts from his grandfather’s trunk from World War I. Submitted. Ed Reynolds in uniform. Courtesy of Door County Historical Museum. A century ago, on the 11th hour of the 11th day of the 11th month, the “war to end all wars” ended. With the signing of the armistice on Nov. 11, 1918, between the Allies of World War I and Germany, a prelude to the formal Treaty of Versailles that would be signed six months later, a devastated Europe began work to restore itself. While the world rejoiced in the renewed peace, Captain Edward Reynolds of Sturgeon Bay sought to return home to his young family, that included his wife and baby daughter. Shortly after the war, he packed his trunk, crossed the Atlantic, and began postwar life. Reynolds was one of 158 men from Door and Kewaunee counties that formed Company F. He was given command of the company from its inception in 1917. Capt. Reynolds and many of the Sturgeon Bay soldiers fought in several notable battles, such as the Battle of Château-Thierry in France as part of the Thirty-Second Division. For its determination and ability to penetrate the German lines, the division was nicknamed “Les Terribles” by the French. 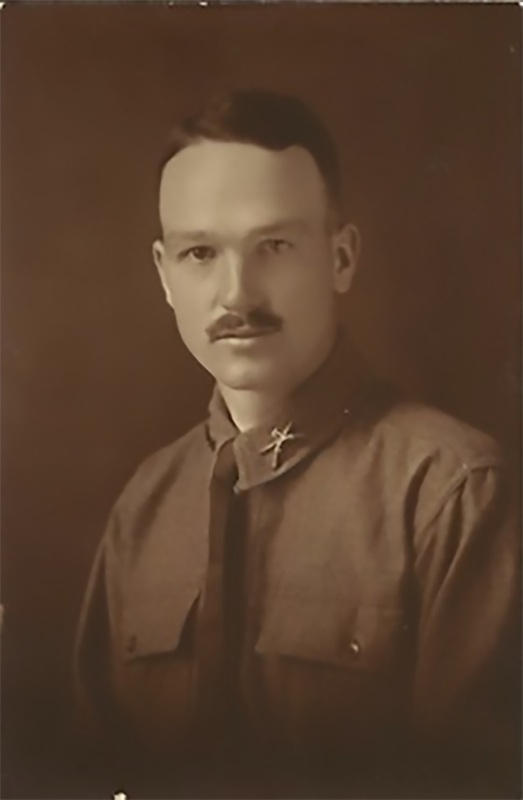 For his service, Reynolds received the Croix de Guerre medal. It was awarded by the French government to soldiers of WWI who displayed acts of bravery in the face of the enemy. Tripp Widder, 73, is one of Reynolds’ 13 grandchildren and the son of Reynolds’ daughter, Sarah. Widder recalls memories of his grandfather, although he acknowledges that Reynolds, like many veterans, shared very little of his war experiences. Reynolds made a significant impact on Widder’s life, largely because of his grandfather’s character. Widder, a graduate of UW-Madison who served in the Army Reserves, continues to practice law at his firm in Madison. Beginning with Reynolds, who graduated in 1915, Widder was the third generation to attend the university after both of his parents attended. His daughter became the fourth. In Reynolds’ later years in life, Widder recalls a Memorial Day parade in Sturgeon Bay in the early 1980s. He remembers seeing the few remaining Company F veterans in a parade car that included his grandfather. Widder also mentioned how important the Company F reunions were to Reynolds, known as “The Last Man’s Club” by the veterans. When Reynolds died in 1987 at the age of 94, Widder was curious who would his attend his grandfather’s funeral due to his age. Patricia Widder, Tripp’s sister, remembers her grandfather for his leadership qualities and the joy that he found in his long life. “He leaves quite a legacy as part of the Reynolds family in Door County and I take great pride in being part of the Reynolds family,” Patricia said. Upon entering the Door County Historical Museum, visitors catch sight of a prominent display in honor of the WWI soldiers, with Reynolds as the representative of the Sturgeon Bay doughboys of Company F.
In the spring of 2018, Bill and Steve Rice, father and son, wanted to commemorate the centennial of the entrance of Company F into World War I. 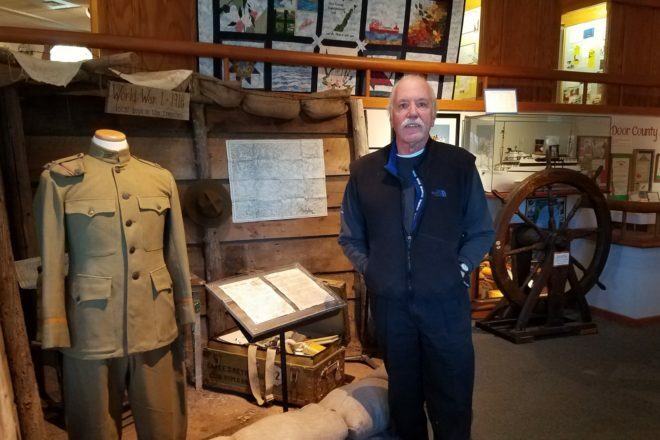 Bill, an assistant curator at the Door County Historical Museum, worked alongside his son for the better part of two months to design a display to showcase a Sturgeon Bay veteran’s experience in the The Great War, Capt. Edward Reynolds. Steve Rice, a well-versed historian, previously worked at the Door County Historical Museum and upon leaving, his father Bill applied for the vacant position and was hired in the same role. Both Rice men are avid historians and sought to replicate the trenches of WWI. From March to April of 2018, the father-son duo worked together to complete the display. The decision to feature Reynolds was an easy one. Since his departure from Europe in February 1919, following three months in the Army of Occupation post-armistice, Reynolds packed his trunk with his items. It would be 65 years until it would be opened again. Reynolds donated the trunk, a time-capsule of his war experience, to the museum in 1984, three years before his death. The trunk contains everything that Reynolds brought back from the war, from his uniforms to maps with hand-drawn notations to his wallet that included currency and personal mementos. Inside the wallet is a picture, no bigger than a half-dollar, of Reynold’s infant daughter, who the Widders identified as their aunt Helen. It is one of the more moving artifacts included in the display. Museum director Maggie Weir was in her first year as a volunteer in 1984 and recalled the process of the museum obtaining the trunk that year after someone brought up Reynolds’ name. Thirty-four years later, Bill and Steve Rice took it upon themselves to honor Reynolds and Company F with a complete display. The Rices began researching time-period trenches only to find countless variations that were used. To create the trench itself, the Rices found items in and around their family barn that itself dates to the late-1800s. Paying close attention to detail, the Rices used dirt from their farm to simulate the conditions of the trenches. They made the trench sloped in, added fence-posts, and a piece of sheet metal to complete the backdrop. Bill Rice added cigarette butts, ash, and intentionally placed a doughnut on Reynold’s desk within the trench. Forty sandbags, weighing 50 pounds each, had to be carried in by hand. In total, the two men carried in an estimated 2,000 pounds of sandbags for the display. The Rices credit a number of individuals and small businesses that offered their services at no charge. Reynolds’ war coat was said to be in extremely poor shape; still full of mud from the trenches more than 60 years ago. Bill Rice contacted DeJardin Cleaners, who were able to make the jacket look pristine again. Reynolds’ military hat was “crushed beyond recognition” from spending decades inside the trunk. Bill Rice contacted Sam Abrego of Hat-cetera in Green Bay with hopes of restoring it. Due to the age of the hat, Abrego did not have a hat block to reform the hat, but instead reshaped it by hand. The finer details for the exhibit continue to come. Bill and Steve continually brainstorm ways to make the display more authentic looking, including placing shell casings in the trench and possibly adding war graffiti in the future. Midway through the project, Bill Rice got in touch with Tripp Widder, Reynolds’ grandson in Madison. Widder allowed Rice to look through an old wooden box filled with mementos from Reynolds’ life. Much of it contained pictures and handwritten letters, but little military information. Rice, however, came across a genealogy of Widder’s ancestors in the box and found an astounding connection. “That was a big shocker,” he concluded.